Watercress is a cruciferous vegetable that belongs to the mustard family. It has small leaves and the stems have a peppery flavor. Watercress is the most ancient of green vegetables known to man and its use can be traced back to the Persians, Greeks and Romans. The delicious, peppery flavor of watercress is great when you have to spice up soups like minestrone or vegetable soups, casseroles, dips, entrees and salads. It also makes a great addition to most sandwich fillings. This bright green, leafy vegetable can also be consumed in a juice form or used as a garnish. It is recognized as a super-vegetable due to its rich content of vitamins and minerals. You can find watercress in specialty grocery stores or at Farmer’s Markets. Watercress packs a significant amount of nutrition. For example, one cup of watercress contains 4 calories and has no fat. It has 106 percent of the Recommended Dietary Allowance, or RDA, for vitamin K, which assists in blood clotting. It also provides 22 percent of vitamin A, 24 percent of vitamin C and 2 percent of vitamin E. These vitamins act asantioxidants to support the health of your eyes and collagen production. Watercress also provides 2 percent of the RDA for vitamin B6, thiamin, riboflavin, phosphorus and magnesium. This 1-cup serving also offers 4 percent of your daily calcium needs. Other minerals that can be found in this vegetable include iron, manganese, potassium, copper and zinc. It contains fiber, folic acid, antioxidants and carotenes. These nutrients occur in higher quantities in watercress than they do in broccoli, tomatoes and apples. Watercress contains many phytochemicals, such as glucosinolates, which are plant compounds that offer disease prevention. 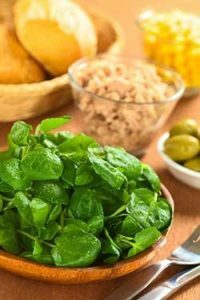 The vitamins and antioxidants found in watercress can assist in healthy skin, hair and nails, bones and teeth, and a strong immune system. Use watercress alone in salads with other delicate greens such as mizuna and baby arugula. Eat a watercress and goat cheese sandwich: Use whole grain bread or cinnamon raisin bread, spread goat cheese on the bread and add watercress. Watercress, watermelon and feta salad: combine all ingredients together with some olive oil and lemon juice. You can also replace the watermelon for avocado. Zucchini and watercress soup: Sautee these vegetables with onion and puree. Puree watercress with garlic and Greek yogurt for a dipping sauce. Add watercress to any pasta dish for a delicious garnish. Cucumber, watercress and parsley salad: combine all ingredients with a dressing made with a little honey, white wine vinegar, black pepper and olive oil. Blend bananas, apples, orange juice, flaxseed and watercress for a powerful green smoothie.